The banana plant is a heavy feeder. It is recommended to feed your banana tree with fertilizer regularly to get bigger bananas. The banana tree will need large quantities of Potassium and Nitrogen. You need to fertilize your banana tree frequently as the roots of the tree are shallow to avoid nutrients of getting washed away. Apply banana fertilizer when the plant is rapidly growing. Continue reading for a detailed banana fertilization information along with the symptoms of deficiency of nutrients. Use a fertilizer high in potassium to feed the tree. Nitrogen and potassium deficiencies are the two most common nutritional problems for bananas. Potassium (K), nitrogen (N) and phosphorus (P) fertilizers should be given to the roots after planting. The leaf and soil analysis can be used to determine the amount of nitrogen, phosphorus and potassium. 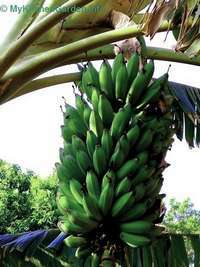 A fertilizer with N:P:K ratio 10:2:22 is recommended for banana plants. I feed my banana plant (How to grow a banana tree), starting with about 100 g every second month and increasing gradually to 500 g as it grows. Ensure that no fertilizer is touching directly against the trunk. Actually, you should not fertilize around 12 inch circle of the trunk. Before the flower about to appear, I apply a handful of Potash around the tree. I also feed my banana plant with potassium rich comfrey tea every fortnight. Nitrogen is needed for the vegetative growth of leaves with healthy green colour. The importance of the nitrogen for a banana plant is understood from the fact that the size, weight and the number of hands in the banana bunch (means total number of bananas) depend on the number and size of the healthy leaves grown during the first 6 months. A deficiency of nitrogen (N) in soil will result in a poor growth rate of the banana plant and reduction in the number of bananas produced. If the leaves are yellowing or reddish pink and the main stem is thin, it means the plant needs more nitrogen. Potassium (K) is the most important plant nutrient in banana production due to the very high potassium content in the banana fruit, banana peels and banana leaves. Potassium is needed to produce larger size and tasty bananas. Apply potassium throughout the growth period, smaller amount at the early stage, then in month before and after flowering. The symptoms of potassium deficiency in a banana tree include small or broken leaves, crumpled leaves, leaf splitting and falling downward, yellow/orange leaves followed by leaf death, and small banana bunches. It should be noted that the amount of potassium taken up from the soil by the plant is very high, so the soil becomes deficient in this important nutrient. You must add potassium rich fertilizer in the soil after you remove the plant. The deficiency of calcium results in reduced leaf length, leaves may turn reddish brown. Application of lime and calcium nitrate can correct the calcium deficiency. The other nutrients needed for the banana production are phosphorus, magnesium, boron and sulfur. In a phosphorus deficient banana plant, the leaves will turn yellow at their margins, purple spots on the leaves and curling of the leaves. A magnesium deficiency causes leaves of banana tree to remain green at the margins and middle and turning yellow everywhere. Deficiency of nutrients (banana tree fertilizer) may cause a banana tree not flowering. Also read how to keep banana fresh longer . Banana Ripening: Principals and Practice, University of Hawaii.